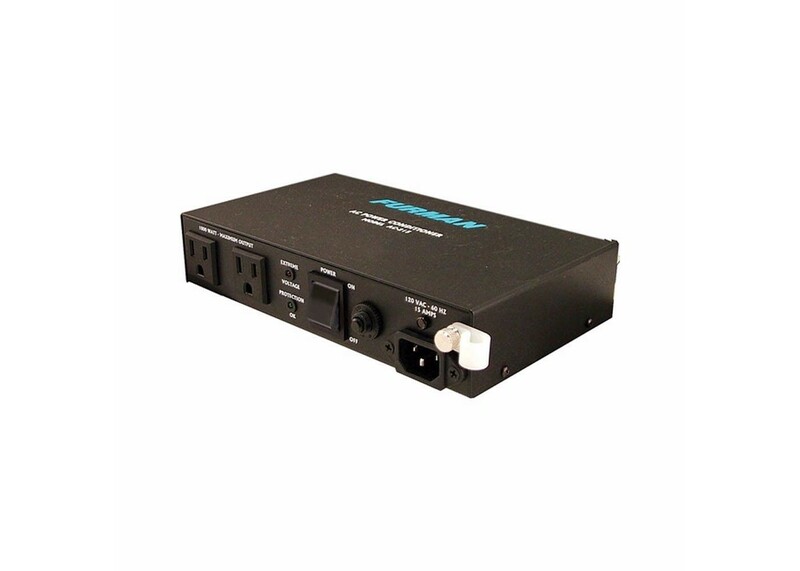 15 Amp compact power conditioner with auto-resetting voltage protection. Includes surface mounting hardware. The AC-215A compact power conditioner features Furman’s revolutionary SMP technology. Furman’s Series Multi-Stage Protection (SMP) circuit features our exclusive Linear Filter Technology (LiFT) and Extreme Voltage Shutdown (EVS). Together, these technologies comprise what is, without question, the world’s most advanced and comprehensive transient voltage surge suppressor. Furman’s SMP surge suppression virtually eliminates service calls. Traditional surge suppression circuits sacrifice themselves when exposed to multiple transient voltage spikes, requiring the dismantling of your system, and repair of your surge suppressor. Not so with SMP. With Furman’s SMP, damaging transient voltages are safely absorbed, clamped and dissipated - no sacrificed parts, no service calls, no down time. Unique to Furman’s SMP is its unparalleled clamping voltage, even when tested beyond the grueling specifications of - USA/CIDA’s A-1-1 test. While other designs offer clamping voltages that are well above 300VAC peak (far beyond long accepted professional standards), Furman’s SMP clamps at 188VAC peak, 133 VAC RMS even when tested with multiple 6000VAC - 3000 Amp surges! This unprecedented level of protection is only available with Furman’s SMP technology.These components harness excess voltage in the incoming power and releases it safely, protecting your equipment without sacrificing components or requiring maintenance. Unfortunately, traditional AC filter/conditioners have been designed for unrealistic laboratory conditions. Prior technologies could actually harm audio and video performance more than they help, due to the resonant peaking of their antiquated, non-linear designs. Under certain conditions, these designs can actually add more than 10 dB of noise to the incoming AC line. Worse still, lost digital data, the need to reboot digital presets, or destroyed digital converters are frequently caused by excessive voltage spikes and AC noise contaminating the equipment ground. Furman’s SMP with LiFT takes another approach, ensuring optimal performance through linear filtering and no leakage to ground.This section filters the incoming AC power in a linear fashion, reducing line noise to unprecedentedly low levels. This ensures optimum performance of all connected equipment. Furman’s trusted overvoltage circuitry protects against all too frequent accidental connections to 208 or 240VAC by shutting off the incoming power until the overvoltage condition is corrected.This circuitry senses extreme or prolonged voltage conditions and automatically turns off the unit, safely powering down all connected equipment. When voltage returns to a safe level, the unit is automatically reset. At only 1.75”H x 5”W x 8.5”D, and weighing in at only 3 lbs., the AC-215A's compact, low-profile design makes it ideal for mounting to the back of a flat-screen television, or anywhere that discretely located, remote power protection and purification are needed. • Weight : 3 lbs.